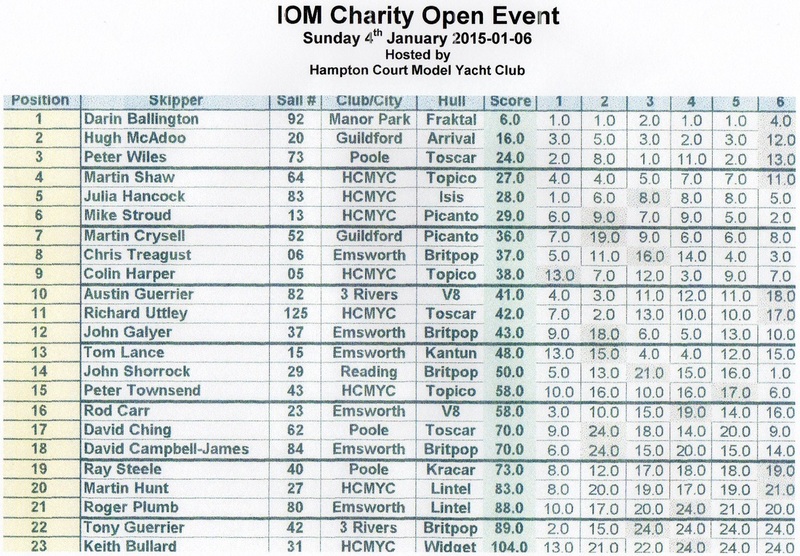 The prospect of fog and light winds didn't put off the 24 skippers who came to Hampton Court on the 4th January for their annual One Metre Charity Open event. 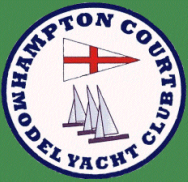 Unfortunately Hampton Court member Dave Andrews had to withdraw prior to racing and Three Rivers skipper Tony Guerrier only sailed one race due to sail winch failure. Both skippers had the potential to win the event. The fleet was divided into two heats. Darin Ballington of Manor Park won his heat and Julia Hancock of Hampton Court, sailing in her first ever open meeting took the other. Due to the very light winds progress on the water was slow and whilst there were no delays off the water only six complete races had been completed by 3pm, the cut off time. The course set was a simple windward leeward arrangement which did allow plenty of overtaking opportunities to those able to read the wind shifts. The first three places went to Darin Ballington (Manor Park) sailing a "Fraktal", Hugh McAdoo (Guildford) sailing an "Arrival" and Peter Wiles (Poole) sailing a "Toscar". Peter had the unfortunate pleasure of catching a plastic bag around his keel when leading one race, a first for Hampton Court. The next three places were taken by Hampton Court skippers - well done. Despite the light wind and lack of sunshine, the sailing was a tremendous success; the racing was competitive whilst remaining fair and the competitors were clearly enjoying their day in the knowledge that they were raising funds for a good cause. At the end of racing, prizes for the first five places were awarded by club Secretary Laurie Bower who was able to confirm, to the delight of all present that the sum of £400 had been raised for Momentum, our nominated charity. My thanks to the Hampton Court race team, Laurie Bower, Gordon Beddall, Peter Smith, Desmond Tew and Graham Gurney.